What drives people's passion for birds and birdwatching? For Jeremy Mynott, it's as much about us as it is about them. He recommends the best books on birds and birdwatching. 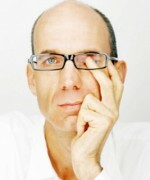 Jeremy Mynott is a Fellow of Wolfson College, Cambridge and the former chief executive of Cambridge University Press. Throughout his career, he spent his hard-won leisure time pursuing his interest in birds in many parts of the world. He now lives in Suffolk, though he still makes regular excursions to watch birds in favourite places including the Hebrides, the Isles of Scilly, the Volga Delta and New York’s Central Park. 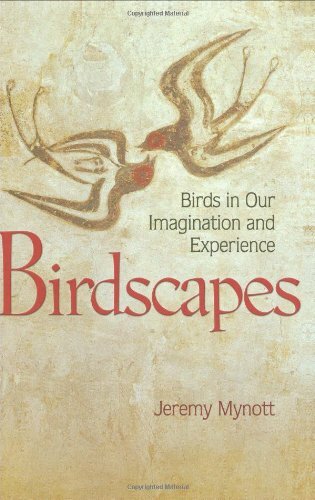 He has devoted much thought to the place of birds in our lives and the reasons we react to them as we do, culminating in his book, Birdscapes: Birds in Our Imagination and Experience, which was published by Princeton University Press in March 2009. He is currently translating Thucydides for the Cambridge Texts in the History of Political Thought series, and his next project will be an anthology of writings about birds in the ancient world. 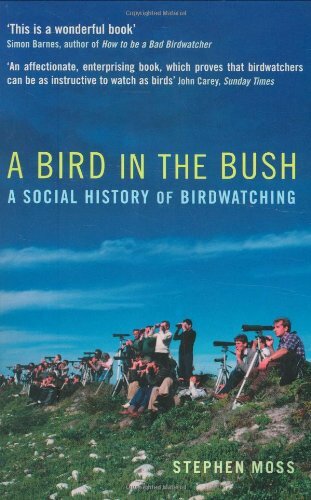 To start off, I asked if you could recommend a book that really captures the atmosphere and the magic of birdwatching – that gives a sense of what it is about it that gets people so addicted. You chose J. 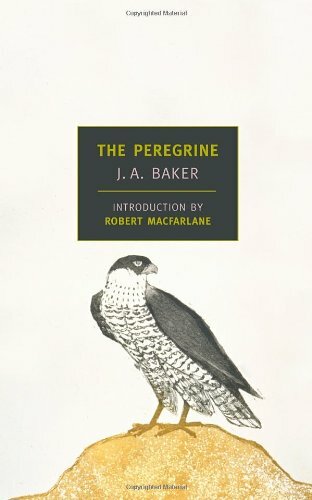 A. Baker’s The Peregrine. Why? This book caught my imagination when I first read it, which was in the late 1960s. It’s a book about one man’s obsession with a particular bird. He was fascinated with a peregrine that he found locally, and he stalked it for a whole year. He tried to follow it in all its movements and get the bird used to him so that he could approach it more closely than a peregrine would normally allow. It’s the story of this pursuit of the bird and how he came to feel a kind of affinity with it, and how he uses the bird as a symbol for the things he feels, or wants to feel, about the natural world. The writing in the book is really rather extraordinary – it’s a very lyrical, very elevated kind of prose that could completely fail, or become too lush or rich or something. He just about teeters on the brink the whole time, and you think, ‘Oh my gosh, he’s overdone it now!’ and then he gets away with it. I think it’s a magnificent piece of writing that I find very moving. And it really gets into his mindset; you understand why he becomes obsessed? Yes. He wants to become the bird, in a sense. And the book finally ends with him approaching the peregrine as it comes to roost. He walks up to within five yards of it, and the bird goes to sleep in front of him. It has accepted him. So it’s a very striking book about what is for many people still a very charismatic bird, the peregrine falcon – which has gone from being a bird of wilderness places, to a bird of our cities. There are peregrines nesting in London and New York now, and many other cities, but they will never be ‘domesticated’. Say I wanted to go birdwatching this weekend. How do I set about it? What do I do? Is that where your next choice, Birds Britannica, comes in? There are many good field guides for the beginner who wants to go out in the field and start identifying birds and looking at their differences and so on. In the UK, I would recommend the Collins Field Guide, in the US, David Sibley’s The Sibley Guide to Birds (now divided into two books: Field Guide to the Birds of Eastern North America and Field Guide to the Birds of Western North America). Birds Britannica is rather different. It’s an encyclopedic work and it’s arranged on a taxonomic basis, so it treats each bird both as part of a family and individually. And it’s a wonderful book to read about any particular bird that you’ve got an interest in, like the robin, or the thrush or the blackbird, or indeed the peregrine. You look up the bird, and there’s a very readable piece not only about what the bird is like, but how it behaves and what its place in our history and our culture has been. 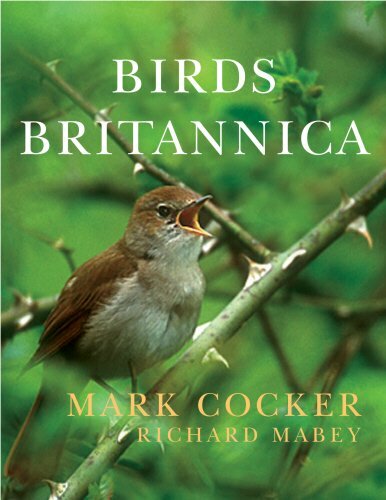 A tremendous number of stories and anecdotes were garnered in the course of putting together Birds Britannica, because the book was produced very interactively. Readers were invited to write or e-mail in as it was being produced with their own stories about these birds, and these were then woven together very skilfully by the editor, Mark Cocker. Each entry has a little history of the part that bird has played in our culture. So you can imagine that for iconic birds like the robin, swallow, eagle, barn owl and nightingale, their entries are stuffed with interesting references from literature, art and everyday life. They’re part of popular culture – they crop up in legends, proverbs and songs, we make images of them on tea towels, wallpaper and ornaments, and they’re familiar to everybody. 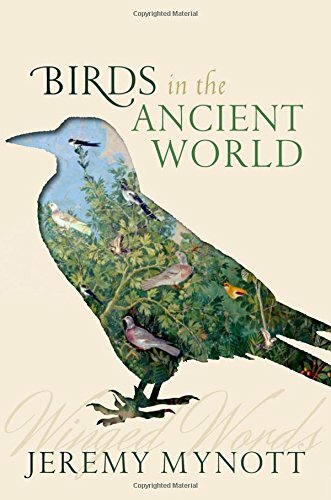 So this is a wonderful book of stories about these birds, which also gives you a lot of good scientific information about them. And it’s enhanced with some wonderful artwork and photographs of birds. So it’s a great reference book, and if you want one reference work on the shelf, this is the one I’d recommend. 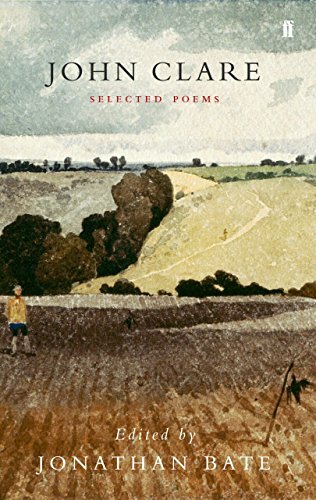 Your next choice is a book of poetry by John Clare. Birds are very prominent in poetry. Think of Shelley and the skylark, Browning and the thrush, Keats and the nightingale – and Coleridge and the albatross. Birds pop up in poetry all the time, and my favourite nature poet is John Clare, whom I like because he has got such a wonderful eye and ear for birds and such a strong ‘sense of place’. He’s a very good observer. He was brought up in rural Northamptonshire as a poor farm labourer, and he had an intense feeling for his local landscape and a very deep knowledge of all the wildlife around him. And he was a wonderful describer of birds. Whereas Keats speaks from his imagination, Clare speaks from experience. I quote him extensively in my book and include quite a few of his poems. He’s got a wonderful eye for just seeing exactly what the birds really are like, and seeing them as part of the landscape that he knew so well. He wrote about many other subjects too, but a lot of his best poems are about birds. This is a relatively new book, and for me it brought everything into perspective. It is a history of the kinds of interest people have taken in birds, from prehistoric times, through to when birds became the subject of scientific examination and interest, of taxonomy and so on, and through to the various stages in the 20th century, when they became the objects of conservation and of obsessive attention from the kinds of birdwatchers who would now be called twitchers: their only interest in birds being in how many different ones they can see, how many they can count and so on. It’s a very good history of the social background to all this and it makes the point, among many others, that birding is a very ecumenical activity – it involves all kinds and levels of people. If you’re standing in a crowd of people watching birds, you could be standing next to an MP, a vicar, a university professor, several working-class lads, a couple of secretaries, and a nightclub dancer. 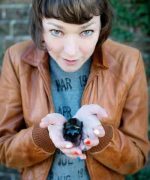 You just can’t tell who is going to take an interest in birds: it’s spread across genders, across occupations, across social classes. And this history is really a kind of map of the different people who take an interest in birds, and the different kinds of interest they take in them. So does Moss feel it’s gone downhill in the 20th century, with all these twitchers, people just looking out for birds so they can tick them off their list? He doesn’t think it’s gone downhill, but he charts various phases, and he makes the point that the phase of the twitcher is now being replaced gradually by people who take a rather broader interest, as I try to do myself of course. He actually refers to Baker’s book on the peregrine as an early marker of a change of interest of that kind, which various other writers are now trying to take further. How would you describe this broader interest that you have? My interest is in the relationship between human beings and birds. My book is as much about us as it is about them, or at least it’s about the connection between the two. Why is it birds that attract such a high degree of interest from us rather than some other group in the animal kingdom? And why is it some birds rather than others? Why do we find some sorts of birds attractive and not others? And what does all this tell us about ourselves? So, finally, you’ve chosen something written in 414 BC. Yes, this is a play called The Birds, written by the Greek comic playwright Aristophanes, who lived in the 5th century BC. He wrote this play in the middle of the great war that was then going on between Athens and Sparta, and it’s about how the birds occupied a middle kingdom between earth and heaven and negotiated deals between the two realms. They are approached by two Athenians, who were fed up with high taxes and bureaucracy in the city and wanted to get a bit of an escape from it. So they went to the birds, as a guide to a better way of life. The birds are being used in an allegorical way, of course. It’s not only a very amusing story, it’s the first example of how birds can become symbols for us, and birds do become symbols for us in all sorts of ways: you’ve only got to think, in America, of the national bird, the bald eagle. You see it everywhere – on flags, postage, the currency and buildings, it is the emblematic bird of the United States. And the story of how it was chosen to be the National Seal of the United States is one I deal with in my book. But the notion of birds as symbols goes all the way back to Aristophanes, and he’s on my list as the origin of that interest. 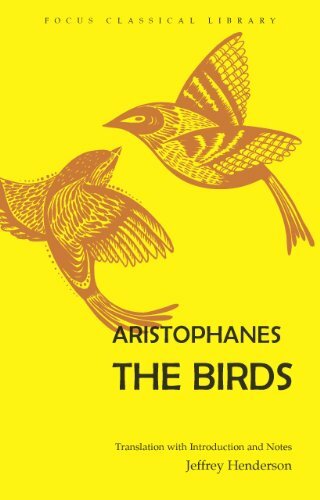 And why does Aristophanes choose birds, do you think? I think it’s because we’ve always had this feeling that birds have a freedom that we don’t have, because they can fly. Flight and movement is one of the key things in our attraction to birds. Birds occupy this area, in his play, between heaven and earth, which plays on the fact they have this freedom and mobility that human beings lack. And that’s also why they crop up in dreams, as well as in nightmares – as Alfred Hitchcock very well realised in conceiving his terrifying film The Birds. I think it’s their airiness that makes them so important to us. One of the books that was only a runner-up and didn’t make your top five I wanted to mention nonetheless, as you say it is the fourth most published book in the English language. Yes, The Natural History of Selborne by Gilbert White is a series of diaries he wrote in the 18th century, and it’s said to be the fourth most published book in the English language after the Bible, Shakespeare and one other (which I think is probably John Buchan). It’s an absolute evergreen classic, there are a tremendous number of different editions of it, and if you go into any bookshop with a natural history section you’ll find it. I think people are just attracted by the simplicity of the diary approach, what he sees and finds every day. White, like John Clare, is a superb observer – he just wrote down exactly what he saw and so helps us to see it too. It’s a very simple form of prose, but it’s got an enduring appeal. It was published in 1789. I wonder why it captures the imagination so much?